carriewriterblog: Marketing Monday: What's Wrong With This Picture? Marketing Monday: What's Wrong With This Picture? Welcome to another installment of "Marketing Monday," where I look at some real life marketing experiences, where I am the guinea pig and another company/person/entrepreneur is marketing to me, and offer insights into what worked, what didn't, and sometimes just a plain old: what's up with that? What We Have Here: So, here we have an opened box of sodas from the Hansen's Natural soda company. They had contacted me on e-mail a few weeks ago saying they had seen my blog, and would I be interested in a sample of the soda. I filled out a form saying "YES!" since as a blogger I generally do have opinions about things- social media...communications....soda....why not? Writers need refreshment too. The Good Part: They found me. They really found me. These days, finding someone counts for a lot. Someone did their marketing homework and thought I'd be good to send this stuff to. Why not Fan us on Facebook? Follow us on Twitter? Make a video of you tasting our sodas and we'll post it on our YouTube page? How about a blog post? Or, please enjoy this $5 coupon off your next purchase of our soda? 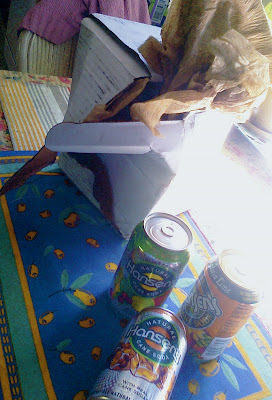 The Takeaway: So, Hansen's Sodas and other liked-minded groups, if you had enclosed that extra note (Call to Action) with your box, I would have focused my post on why I really liked the Mandarin Lime, instead of what was missing from the box. You had a great idea to start with, you just needed to finish it. Otherwise, thank you for the 6 cans of soda, that are now finished. I would get more, but I don't have a coupon. PS. I just checked the Hansen's web site, no social media or blog to be found, but nice site otherwise, with cool bubble icons that come up when you click on the nav bars. Now, that's clever marketing.